Now that I’ve finally completed all my bee commitments, it’s time to get the last few block written about and posted here. Though these are for November, I actually made these blocks last, for reason you’ll soon discover. Mr November is Scott Hansen, who can be found on Instagram as Bluenickelsudios and in the blogsphere here. For his month Scott requested something which, at first, sent a shiver down my spine. 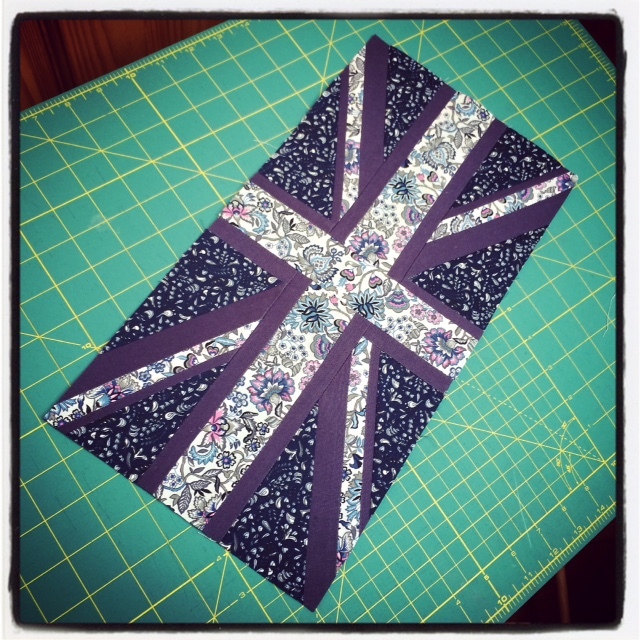 He asked for Union Jack blocks, based on a tutorial by fellow bee member and all round fabulous Molli Sparkles. 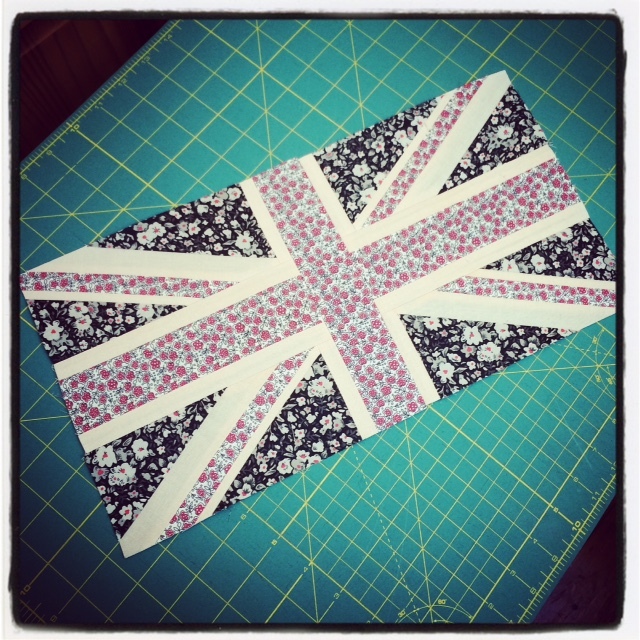 He wanted the flags to be made using ‘Liberty-inspired florals’, and since I had no actual Liberty to hand, I had to do a little shopping. 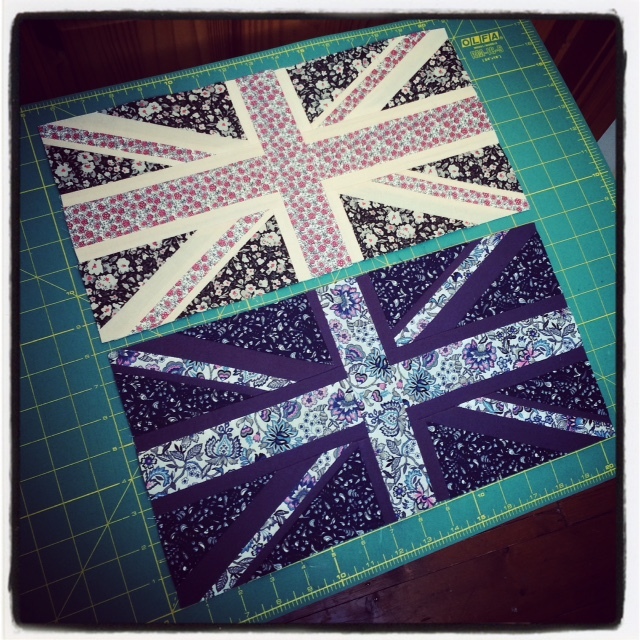 The life of a quilter is often hard! Now, since improv piecing entered my brain and took over the controls, blocks like this, with long cutting lists and precise measurements, are something I’ve avoided. That’s not to say I was drawn to them in the first place; all that measuring and maintaining of accuracy just isn’t for me. I get too stressed, too worked up with precision. Now you see why I avoided making these until the last days of January! I finally bit the bullet and got down to it, feeling terribly guilty that I made Scott wait so long already. After all the hype, they really weren’t that bad. Yes, accuracy is needed, and yes, your seam allowances has to be on point (though one of my blocks was a hair breadth shy of the final size) but as I began the second block I actually found myself enjoying the process, probably for no other reason than the end was in sight! Anyway, Whilst I won’t be making these blocks again in hurry, I’m happy to contribute to Scott’s vision, which I think is going to look awesome. These fabrics aren’t something I’d usually be seen at a checkout with, but I did enjoy picking florals and matching them to solids. I love the contrast between the two blocks and hope that Scott will too.